Move over Jim and Pam—there’s a new favorite couple on The Office. Which is more romantic: Paris in the spring or the conference room at 3:00 in the afternoon? Surprisingly, your drab little cubicle may be a more likely place to find love than you think. According to a recent study by Monster,1 roughly 46% of respondents said they would be open to dating a colleague, with 19% saying they would date a colleague even if it put their career at risk. Maybe there’s something to be said about the aphrodisiac effect of fluorescent lights and the smell of copy toner. Or maybe it’s the fact that office romances are still considered a bit taboo. Whatever the reason, we can’t seem to get enough of our office love affairs, especially on TV. 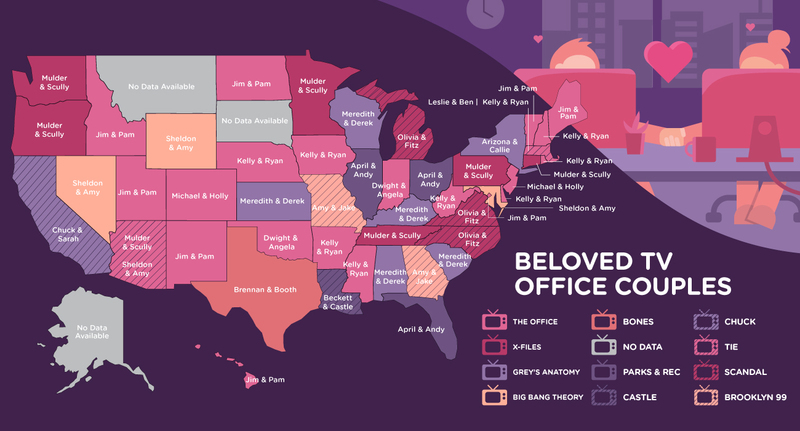 So in honor of Valentine’s Day, we decided to figure out which TV workplace couples have captured the fascination of American viewers (and which ones we just couldn’t care less about), and we were pretty surprised by the results. To get our results, we started with a list of popular workplace couples from TV. Then we analyzed Google Trends data from each state over the past 10 years to see which couples people were searching for. Note: While most of our data was based on searches between 2009 and 2019, we adjusted our data for Kelly and Ryan to exclude searches from the past two years. Why? Because LIVE with Kelly and Ryan came out in 2017. And while we get it if you ship Kelly Ripa and Ryan Seacrest, we definitely wouldn’t classify them as an “office romance”—at least not right now. To our astonishment, Jim and Pam, the ultimate workplace couple, just barely missed out on the number one spot. But even more incredibly, they lost to none other than Ryan and Kelly (also from The Office). The closest we can figure is people in Arkansas, Delaware, Iowa, Massachusetts, Mississippi, Nebraska, New Hampshire, Rhode Island, and West Virginia just really love all the comedic elements of Kelly and Ryan’s relationship. Also surprisingly, Mulder and Scully from FOX’s X-Files came in third on our list. We get the will-they-won’t-they appeal of the couple. But we also think it’s possible people are just confused about the status of Sculder. Whose baby did Scully have? Wait, why are they estranged now? Did they even wind up together at the end? It’s enough to get us Googling too. What we weren’t shocked about, though, were the least beloved office relationships. Everything about Angela and Andy’s “romance” was cringeworthy, so we completely understand why no one would search for them. As for the rest . . . to be honest, we barely remembered the other relationships on our “least beloved” list. With the exception of Charlie and Amita from Numb3rs, none of the other couples on the list involve main characters from their respective shows. Most of them also have up-and-down relationships with at least one breakup. Now, if Kelly and Ryan’s number-one spot tells us anything, America’s not opposed to stories about couples with rocky roads to love. But we seriously doubt that Danny and Lindsay or Felicity and Ray are bringing the comedic value we get from Kelly and Ryan. We were shocked—shocked!—that Leslie and Ben from Parks and Rec didn’t get more love. Props to Massachusetts for being the only state to show a little taste, though even there our precious Beslie still tied with Kelly and Ryan. Do you agree with our rankings? Be sure to let us know who your favorite TV office couple is on Facebook, Twitter, or in the comments below.